One of the most blogged-about new apps for iDevices is streamlined. It’s useful. It’s innovative. And it was developed by two sixteen-year-old high school sophomores. 8 days or more, but these settings are adjustable. 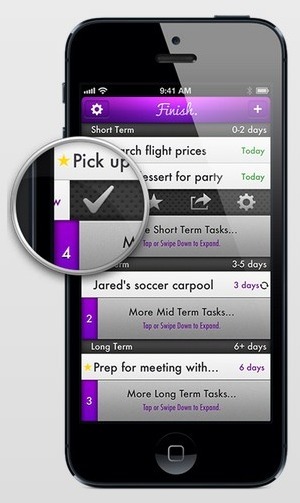 Finish is nothing if not user friendly; simply type in the task you have to accomplish (e.g. “Email Prof. Chen re: paper”), select the deadline for the task, and that’s it! Finish will place the task under the appropriate heading. Users can scroll through the list under each heading and either edit, check off or star entries as needed. Finish keeps lists up to date, too. Enter a deadline for a paper due in two weeks and the task will automatically move from your long-term list to your mid-, then short-term lists as crunch time approaches. Users can enable push notifications to let them know when tasks are due, and it is easy to move tasks from list to list as needed, too. Finish even allows users to repeat tasks. Got a study group every Monday evening at 5:00? Simply enter it once and indicate that you want the task to repeat weekly. Finish will take care of the rest. Finish is a fantastic app, but users should consider a few potential downsides. One is that it does not sync with other devices, so those who have well-established calendars on computers or iPads may not want to take the trouble to duplicate their agendas. For iPhone-reliant students, however, this may not be a problem. Also, while Finish’s simplicity is one of its best features, it is so basic that users cannot enter times, locations, or notes to accompany each task. This limitation can be skirted by typing “Tutoring @ 5 in library” as opposed to simply “Tutoring” for the task, but this takes a bit of extra legwork. Again, this may or may not be a deal breaker depending on your individual preferences. Updates to Finish have been promised that may address these issues. Despite its minor limitations, we think Finish is an innovative, functional app that could be just the ticket for organizing a hectic schedule. Finish is available for $0.99 from the iTunes store.